Nicola Spedalieri (Bronte 12.6.1740 -- Rome 11.26.1795), great philoso­pher, was an author of the "De’ diritti dell’Uomo" (The rights of man) with which he was the first in Italy to talk about the natural rights of man and proclaimed from Rome the sacredness of principles of equality and freedom. He began the first studies in Bronte, in the S. Filippo Neri Oratory, next to the church of Catena. When he was eleven year old continued to study in the diocesan seminary of Monreale distinguishing himself in philosophy, painting and music, eloquence studies, and sacred sciences. 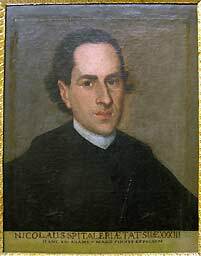 Professor of philosophy and geometry in the same seminary (at 25 years of age); he was a poet, musician, orator, historian, mathematician and also apologist and publicist. Prodigious genius and also theologian of independent spirit was writing freely not bearing well the rigid hypocrisies of his times and the theological fanaticism. The tense reasoning supported in his first thesis collided soon with the theologians of Palermo and he was accused of impiety, of rashness and even of heresy. In Palermo he was not allowed to print a "tesario teologico" (theological thesauri, useful to train and stimulate the students): not only they were not approved by the ecclesiastical censors, but they were rejected, as in odor of heresy. He got then his writings examined in Rome and "with permission by the teacher of the sacred palace P. Ricchini" (to which exam were submitted by the Pope's order) and his "Propositionum theologicarum specimen" (Rome, 1772) was printed the same year. 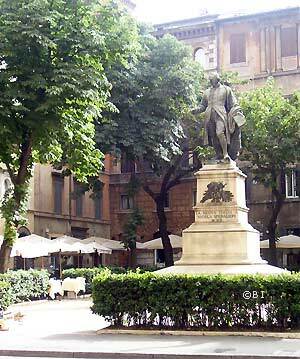 Then he went Bach to Palermo to present his book to the public. The implacable contrasts that he had in Sicily, the enemies and the overwhelming triumphs of his intelligence had pushed him to abandon for ever the island and move in 1773 in Rome, where lived for over twenty years. He made the journey with the money (12 onzes) that he borrowed from a brontese priest staying in Palermo and in Rome spent a few uneasy months, disheartened and in big poverty. 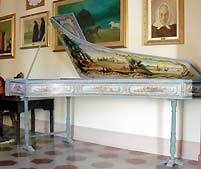 A legend tells that in the first days, dressed as Calabrian farmer, with leather shoes, velvet jacket, skin bodice and funnel hat, earned his living playing the harp in the squares and in front of the inns in the courtyards of the princely palaces. Of that period, the same Spedalieri, will later write that to keep going he had to use "oars, rather than sails" and that "the greater glory of a man is to owe everything to himself ". Preceded from the rumble produced in Monreale by the famous theological thesis, he finally found in Rome the suitable field for his vocation of philosopher and publicist. He made himself known to the cultural world and, already in the October of 1774, was admitted to the literary academy of the Arcadia with diploma of free admission (a sign of respect) assuming the nickname of Melanzio Alcioneo; well-known and appreciated by the Corte Romana, especially by Pope Pius VI that had great trust on him. The Pope asked him to write the History of the draining and reclamation of the pontine marshes (arranged by Pius VI) and his famous work on the rights of man, wanted to stem somehow the revolutionary theories spreading from France. Zealous defender of Christianity and supporter of popular sovereignty, fought with several controversial and apologetic writings the theses of the encyclopedists, defending truthfulness and authenticity of the Writing. His first important philosophical work is of 1778 (four years after his coming to Rome): 472 pages, in 8° grand, in defense of religion and entitled "Analisi dell’Esame critico del cristianesimo di Nicola Frèret" (Analysis Of The Critical Exam of Christianity by Nicola Frèret). The work had a remarkable success and the name of the Spedalieri became very popular in Rome and in all Christendom. In 1779, on occasion of solemn celebrations for the recovery of the Governor and Pius VI, he kept two famous speeches in Rome about the "Arte di governare" (Governing Art) and the "Influenza della religione cristiana nella società civile" (Influence of the Christian Religion in Civil Society) in which he was already anticipating the themes of his most important work. In 1784 he wrote another mighty apologia of Christianity, the Gibbon Confuta­tion, that, in his History, had attributed the decadence of the Roman empire to the Christianity. 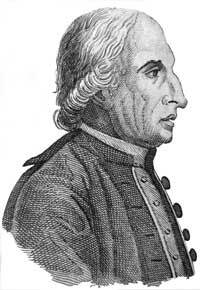 In his more important work "Dei diritti dell’uomo" (About the rights of man) (1791), the Spedalieri, moving from the thesis of the contract as origin of society, claimed that the Christian religion is "the safest keeper of man's rights" a guarantee against the abuse of despotism justifying the rebellion to the autho­rity, when this does not respect "the natural rights" which had been somewhat dispensed with by the French revolution. His ideas (against the absolutism, on the sovereignty and on the right of the people to knock down the tyranny), very advanced for the time, in a moment of transition and of grave ideological tensions, sowed dismay in the absolutist courts and in the curial circles. The pontiff Pius VI allowed the publication of the book in Rome, even if with the false indication of Assisi and the frontispiece deprived of the ritual ecclesiastical approvals, replaced by the hastiest formula "with license of the superiors". The work had an extraordinary book success: in a brief while was reprinted four times and in various towns, as the first numerous exemplary were not sufficient to satisfy the requests coming from theologians, jurists, politicians and Italian and European men of culture. It provoked also much hatred and ferocious criticisms and a crusade of books and brochures tried, with poisonous insults, to confute and demolish the philosopher advanced theses. 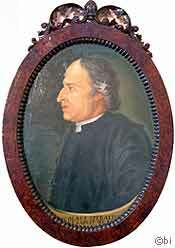 The Spedalieri had again to fight against the moderate lay, the religious and also the progressist thinkers (Rosmini, Taparelli-D’Azeglio, Cantù). 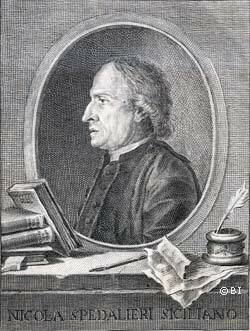 Among the many detractors, also a fellow villager of his, the friar Capuchin Gesualdo De Luca: for him the Spedalieri was "a very miserable typist of the most impious theories that the raving ("Rousseau and similar mad people") had written about the origin and the natural qualities of rights and duties of men ..." and So "wrapped in many contradictions, he became target of bitterest derisions and censures from Catholic writers Magni nominis ... ". The doctrine "Of the rights of man", that was teaching the popular sovereignty and the recognition of the fundamental rights of man was considered dangerous and subversive; the Savoy House forbade in 1792 the spreading of the book in Italy. The work was also forbidden up to 1860 in all the kingdoms and the European courts of the epoch. The last book of the Spedalieri, "Storia delle paludi pontine" (History of the pontine marshes), written in Latino by wish of Pius VI, was translated into Italian, and published in 1800 after the death of the great philosopher. 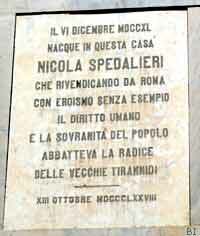 Nicola Spedalieri died suddenly in Rome on November 26th 1795. From this was born the legend of having been poisoned by one of his many opponents. He was buried in the San Michele Magno oratory, property of the Vatican Chapter. The papal state coined in his honor a medal and had a mosaic built in front of his grave (the epigraph says "Memoriae Nicolai Spedalieri presbiteri nazione siculi domo Bronte..." (Memoriae Nicolai Spedalieri siculi nation presbyteries subdue Bronte ...). In his twenty-one years of residence in Rome he established friendly relationships with the most illustrious prelates, scholars and artists of the time (the Cardinal Borromeo, Vincenzo Monti, Winckelmam, Milizia, Canova, Mengs and others). Nicola Spedalieri was interested also in music (he was an excellent harp player) and of painting that he loved and studied since the first years spent in Montreal. The Vatican library preserves the originals of a few of his musical works; his harpsichord (of 1679, attributable to Petrus Todinus), recently restored and his self-portrait (painted when he was thirty-three years old, in 1773) are preserved in the premises of the Capizzi College, together with other writings and objects of his (the Spedalieriane relics). Pious VI recognized the merits of the great bron­tese apologist and wanted him near to have a valid help in the tasks that he wanted to entrust him with. In order to keep him in Rome and divert him from the teaching at Pavia university that had been pro­po­sed to him, he offered to help him with a modest reward (about ten scudi per month) giving him the title of benefited from the Vatican basilica in opposition to a rule of Leone X, that prohibited such a position to a not Roman citizen. 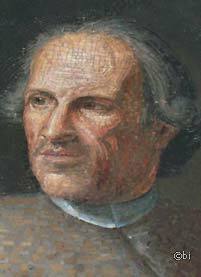 The self-portrait of Nicola Spe­da­lieri, preserved among the Spe­dalieriane relics In The Real Ca­piz­zi College. The painting, executed when he was 33 years old, was given to the college in 1886 by the heirs of the philoso­pher. The inscription below says: "Nicolaus Spitaleri aetat suae XXXIII / Hanc on the suàmet manu pinxit effigiem". Spitaleri, in fact, was the name ori­ginal of the philosopher, chan­ged subse­quently by him in Spe­dalieri during his stay in Rome. The 13th of October 1878 the brontesi wanted to pay tribute to the philosopher (“… that claiming from Rome with exemplary heroism human rights and people’ sovereignty pulled down every root of ancient tyranny”) putting a plaque in his birthplace, at the number 26 of Annunziata street. A big Nicola Spe­dalieri statue ("La Nuova Italia a Nicola Spedalieri - MCMIII") was built in Rome very close to the Vati­can (in Piazza Ce­sa­ri­ni Sforza, on the Corso Vittorio Emanuele, in the New Church). The statue (the first of a Sicilian built in the Capi­tal) was sculpted by the Sicilian Ma­rio Ru­telli, winner of the national con­test kept in Rome in April of 1895. A few sketches presented to the National Committee for the erection of a Statue In Rome of the philosopher Ni­cola Spe­dalieri. The scul­ptors Rutelli (a Sicilian, what it won) partici­pated among the others, A. Ghigli and An­tonio Ugo. To want it, subse­quen­tly to the celebration of the first centenary of the philosopher death, was a natio­nal Committee in which took part, among others, Giuseppe Cimbali (the true animator of the initiative), Crispi, Baccelli, Co­lajanni, Capuana, Pitrè, De Felice, Salan­dra, Bovio, Rapi­sardi, Zanar­delli. The Council of Bronte participated to the cost of the work with L. 1.000; Many contri­butions arrived also from other Councils of Sicily: Regalbuto (Lit 50), Niscemi (L. 30), Aidone (L. 10), Palermo (L.100) and her give her Province Of Catania (L. 1.000), Girgenti (L. 100), Caltanis­setta (L. 200) and Palermo (L. 300). 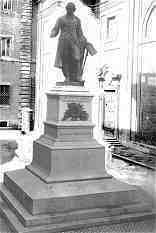 The State gave L. 4.000; King Umberto ("high admirer of the innovating doctrines of the Bronte's philosopher") contributed to the ejection of the monument with L. 500 (a century before, in 1792, the Savoy house had instead forbidden the spreading in Italy of the book "Of the rights of the man"). 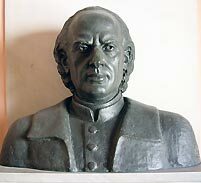 At Catania, in 1865, the prestigious secondary school was dedicated to the brontese philosopher "N. Spedalieri".